CATARMAN, Northern Samar – An alleged top official of the New People’s Army (NPA) and this town’s former president of the Association of Barangay Chairmen (ABC) were arrested by operatives in an operation on July 13. Arrested by police and soldiers operatives were Marieta Bartolo, 46, said to be a top official of the NPA operating in Northern Samar, and Ruth Figueroa, 56, former ABC president of the town. 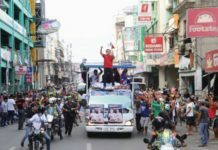 Bartolo was said to be carrying the aliases of ‘Tawang’ and ‘Silang’ while Figueroa is the incumbent chairwoman of Barangay Zone 3 of the University of Eastern Philippines (UEP), former ABC president of the town. Chief Inspector Rafael Tayaban, civil relations officer of the Northern Samar Police Provincial Office, said that the two were arrested at about 6 pm in Barangay Bankerojan, this town, on board a vehicle owned by Figueroa. Also arrested were their companions identified as Emboy Loberiano, 21, single, resident of Brgy.Cal-igang; Danny Basiloy,35, single, resident of Brgy.UEP Zone 3 and Gil Mijares, resident of Brgy. Ipil-ipil, driver of the vehicle. The operatives flagged down the vehicle where the suspects and their companions were on board to effect the warrants issued by local courts against Bartolo. 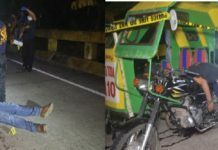 However, instead of heeding the authorities, the driver of the vehicle did not stop which resulted for them to hit the tires of the vehicle, Tayaban said. The warrants issued by different local courts against the alleged top NPA leader involved for murder, double murder, and frustrated murder. Bartolo and her companions were arrested by joint elements of the Catarman Police Station, the Northern Samar Police Provincial Investigation Bureau (NSPIB), the Regional Intelligence Unit 8 (RIU8) and the 803rd Brigade Philippine Army. Captain Ryan Velez, civil military officer of the 803rd Infantry Brigade, said that Bartolo had been under surveillance by the police and the Philippine Army for a long time before they executed her arrest. “This (arrest) is the product of long planning and surveillance… we received information that she was about to travel so we conducted the apprehension.” Velez said. The Scene of the Crime Operatives (SOCO) recovered six firearms and cash worth P330,000; bags of bread and some personal belongings. Velez said they will file charges for illegal possession of firearms against Bartolo and all her companions. Except for Figueroa who was brought to the Northern Samar Provincial Hospital after she felt ill while being investigated inside the Northern Samar Police Provincial Office in Camp Carlos Delgado, all the suspects are now detained at the local up cell of the provincial PNP headquarters.